I LOVE Pinterest. Love love love it. I actually get lost on it sometimes because I am just moving from one search to another. So far I’ve made a Thanksgiving centerpiece off of a Pinterest find and now these cute little cookies. I’ve been seeing these all around Pinterest and finally took the plunge and made them. They are the easiest thing in the world and only require 3 ingredients. They are so cute with the little ears (pretzel) and button nose (m&ms). Preheat oven to 200 degrees. Place as many pretzels as you can on a cookie sheet. 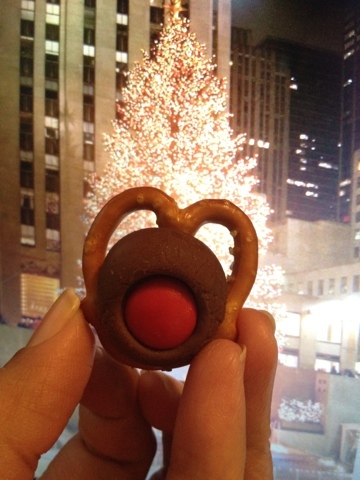 Place one unwrapped Hershey’s kiss atop the pretzel. Place in the oven for 3-5 minutes until beginning to melt. Place an M&M on top of melted chocolate and flatten. Refrigerate to ensure they harden. Enjoy.